Parachute Advansed Body Lotion is uniquely crafted with the goodness of Coconut Milk & 100% Natural Moisturisers. It penetrates 4 layers deep into the skin and nourishes from within, keeping skin moisturized for 24 hours, and leaving you with irresistibly soft & smooth skin. 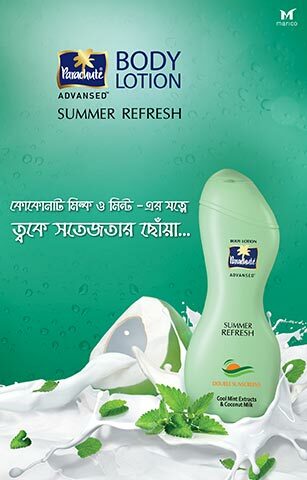 Parachute Advansed body lotion now comes in following variants to meet your year long skin care needs. Parachute Advansed Deep Nourish –The variant that gives skin extra nourishment and is an intense moisturizing solution for protection in the dry seasons. Parachute Advansed Summer Refresh –The new variant contains cool mint extracts with coconut milk, keeping skin refreshed & soft during sunny shiny days. Its double sunscreen component provides protection against the harsh sun, resulting in the perfect solution for all your skin needs.